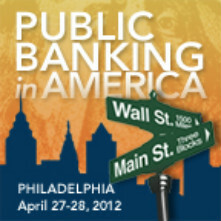 2012 is the year that the Public Banking Institute brings public banking into the public discussion. What better way to do it than to have a public debate - old style? The first debate will be held in Petaluma, CA and will be a debate on the question "Should Sonoma County have its Own Bank?" 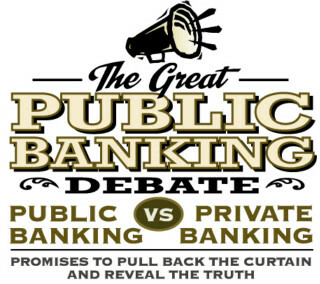 Ellen Brown, founder of the Public Banking Institute, will debate members of the public. A featured guest -- the Monopoly Banker -- is rumoured to be getting his outfit ready. This debate will be just the first of many debates throughout the USA. 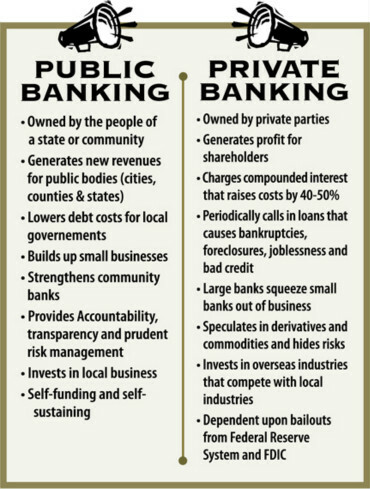 Does your county need a public bank? Should your state start its own bank? Debate it -- in the open, with your friends and colleagues. It's past time to get this question out in the open. We could very well be on the brink of another credit crisis, brought to us by Wall Street and the Federal Government. Debating this topic will give us an idea of what sort of alternative we could construct for ourselves. Schedule a Debate Now - Contact Us! –Abraham Lincoln, after the National Banking Act of 1863 was passed. Occupy Petaluma is hosting this event at the new Sunflower Center. Be sure to come early for dinner with the debate participents. Participants include Ernie Carpenter, former Sonoma County Supervisor, and Ellen Brown, author of Web of Debt. The question being debated is "Should Sonoma County Own A Public Bank?" system behind it - and the threat that both pose to our communities. Do you have other events, debates, and/or conferences that PBI should know about and possibly list? Let us know!